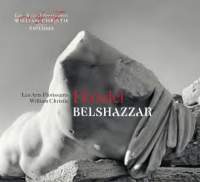 No single authentic version of Belshazzar (1745) offers an ideal text, so William Christie collates what he thinks is ‘the most successful of the various versions…with the best music and a coherent libretto’. On the whole Christie gets the important choices right but I am surprised that the recitative which reports Belshazzar’s ominous relapse into hedonism is cropped to its bare minimum. Christie sometimes tinkers with small details in Handel’s score: Nitocris’s imploring siciliano ‘Regard, O son, my flowing tears’ (sung emotively by Rosemary Joshua) sounds lovely with just a solo oboe but Handel marked it for unison orchestral violins. However, unauthorised rescoring around the fringes does not prevent the pacing and personality of the music from consistently feeling just right. Allan Clayton sails through the tricky juxtaposition of rapid semiquavers and merry outbursts in Belshazzar’s ‘Let festal joy triumphant reign’ with delectable nonchalance, and his characterisation astutely descends from carefree charm to self destructive sneering (although I regret Christie’s decision to cut the da capo repeat of the quarrelling duet ‘Oh dearer than my life, forbear’). Daniel’s ‘Lament not thus’ was dropped by Handel before the first performance and its reinstatement here is amply justified by sweetly compassionate singing from Iestyn Davies, who also sings radiantly in the lovely verse-anthem finale ‘I will magnify thee’ (Christie restores a lovely 10-bar passage in the alto solo that is usually cut). Caitlin Hulcup is ideally authoritative and articulate as the Persian monarch Cyrus, the symbol of an enlightened patriot king who is the polar opposite of the decadent and hedonistic Babylonian blasphemer; ‘Destructive war’ is despatched briskly and with plenty of verve. Jonathan Lemalu’s dark resonance suits Gobrias’s extrovert coloratura description of the libertine Belshazzar ‘wallowing in excessive feast’ (‘Behold the monstrous human beast’), and he sings plaintively in Handel’s original setting of ‘To pow’r immortal my first thanks are due’. The choir of Les Arts Florissants acquit themselves with full honours in Handel’s imaginative dramatic narrative choruses: there is astute characterisation of Persians complaining of ‘a tedious time’ waiting outside the walls of Babylon, the Assyrians getting blind drunk at the feast of Sesach and the Jews expressing mortification at Belshazzar drinking from the goblets stolen from the Temple at Jerusalem (the sublime ‘Recall, O king, thy rash command’). Trevor Pinnock’s supremely accomplished recording is a classic of its kind but Christie presents a genuinely comparable alternative that has a few small disadvantages but some considerable theatrical merits.